I enjoyed connecting with Dr. Robert Dillon, Director of Technology and Innovation for Affton Schools in Affton, Missouri. Dr. Dillon is a former Middle School Principal who clearly works hard to empower teachers and students. 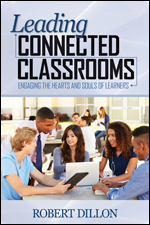 His latest book, Leading Connected Educators includes the stories of several successful Missouri educators.